There are many things I love about our home but the one thing I have really struggled with in this house is the backyard. It is small as the garage takes up at least 1/3 of the space. No adult areas to relax or even sit. The wasps and bees make it almost impossible to eat outside which was a big disappointment! It is awkwardly shaped–a big deal for me as I am very much a symmetrical, non-angle kinda gal. 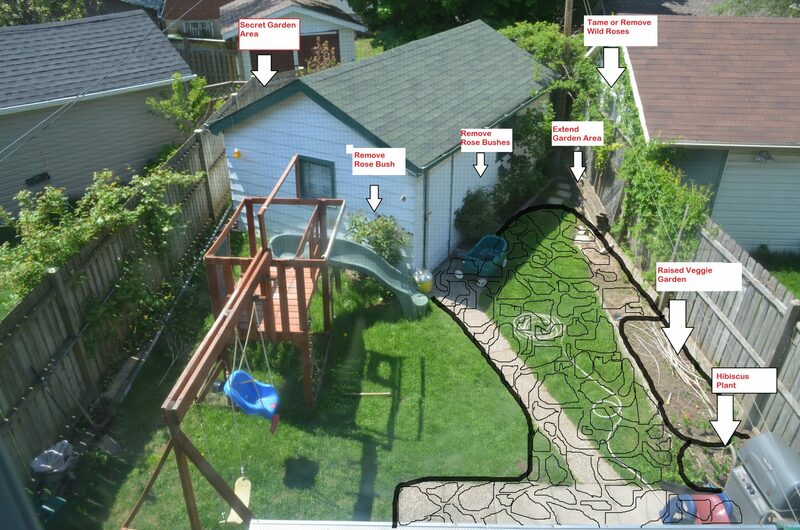 The backyard isn’t a space that we use other than to let the kids loose to do their thing and BBQ on occasion. It’s a bit of a visual disaster too as I feel like the gardens are cluttered and not really planned out well…it all needs help! 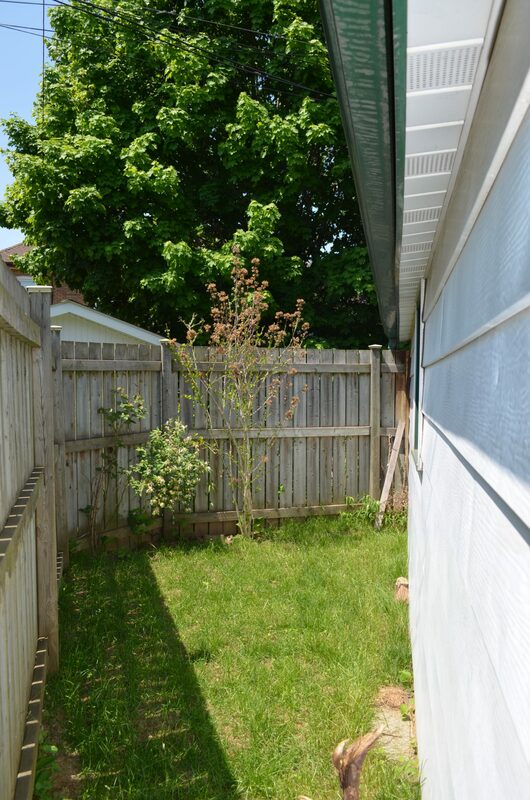 Just like everything else in this house, the backyard is a work in progress…but a slow one! Initially, there were huge 4-foot-wide tall shrubs that lined both sides of the fence; they looked nice in the winter, but took up so much space we decided to pull them out. We turned the one side into a vegetable garden and tried to spruce up the other side with some plants. The back porch/deck was also something that we changed out after a couple of years. 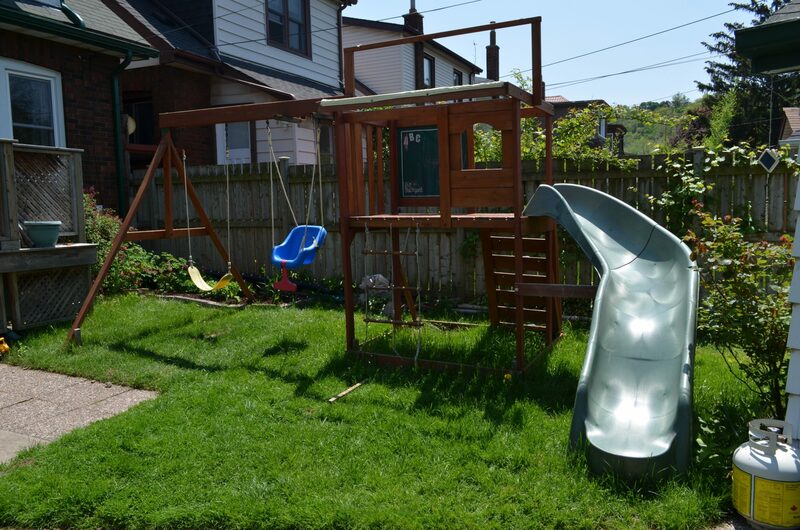 It was an 8 x 8 deck that ate up a big chunk of the yard and since eating outside wasn’t an option, we decided to shorten it to about 4 feet so the little ones had more space to play. Add in large swing/slide set and here we are! 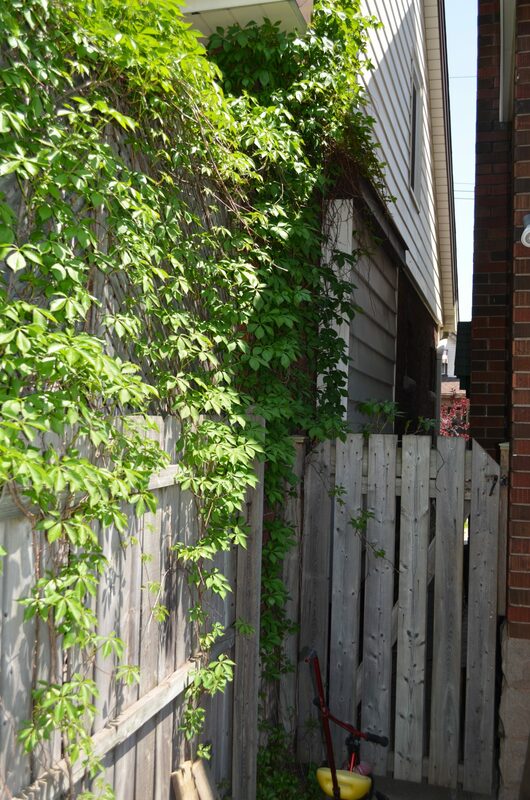 Upon realizing how much I really dislike my backyard in its current state, I have been thinking of ideas to make it more visually pleasing–a place I find beauty in. In the past, I would flip through magazines and admire lovely landscaped yards—large or small—but never really think I could do it in my own backyard. I just couldn’t get over the awkward angles and didn’t know where to start to make it look nice. But somehow, this year, something just clicked and I had a few ideas that could actually work! I have always loved an English style garden where things are grouped together closely and there is a nice mix of texture and color. 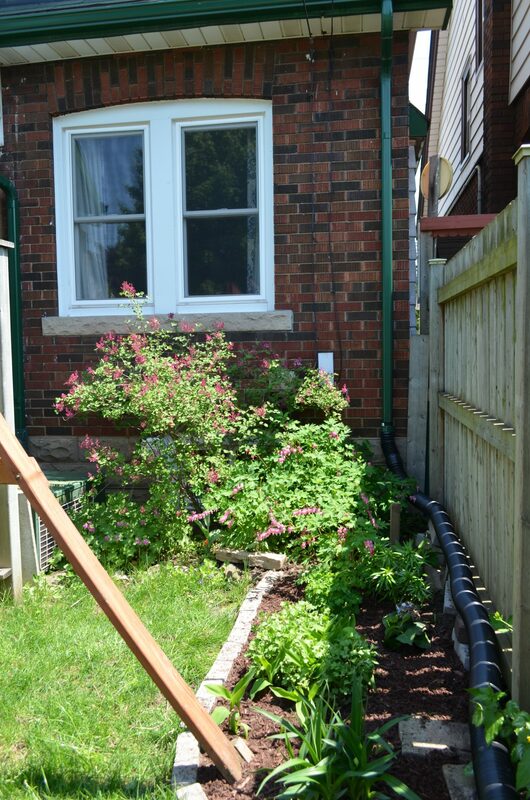 Achieving that in such a small space is a challenge, but I know that I can add in various perennials and make it a lot more interesting than it is currently. Pink roses are my favorite, but 4 out of the 5 bushes have red blooms so I will give a couple of them away to make space for other things—like climbing roses in my favorite hue! There is a wild rose—um—tree (if that’s what you want to call it!) that is amazing when it blooms but otherwise just looks like a disaster; its going in every direction and we have no idea what to do with it! 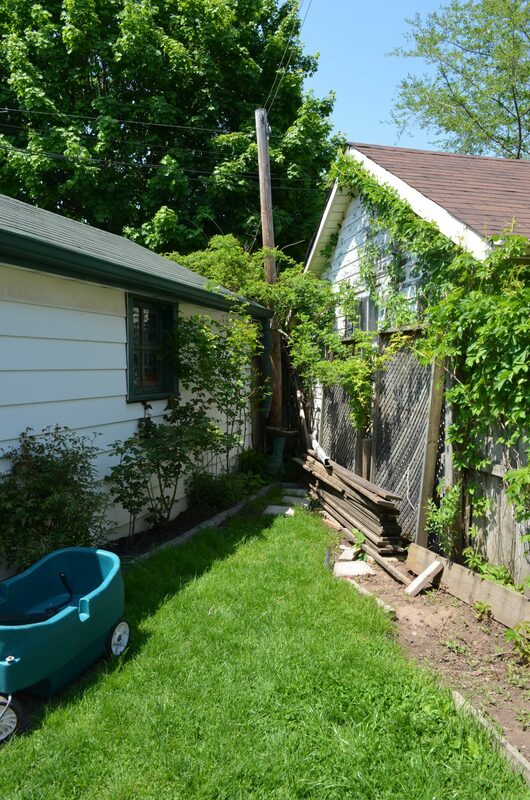 Maybe we could cut it back…and train it to go around a trellis, but not sure if that is even feasible. 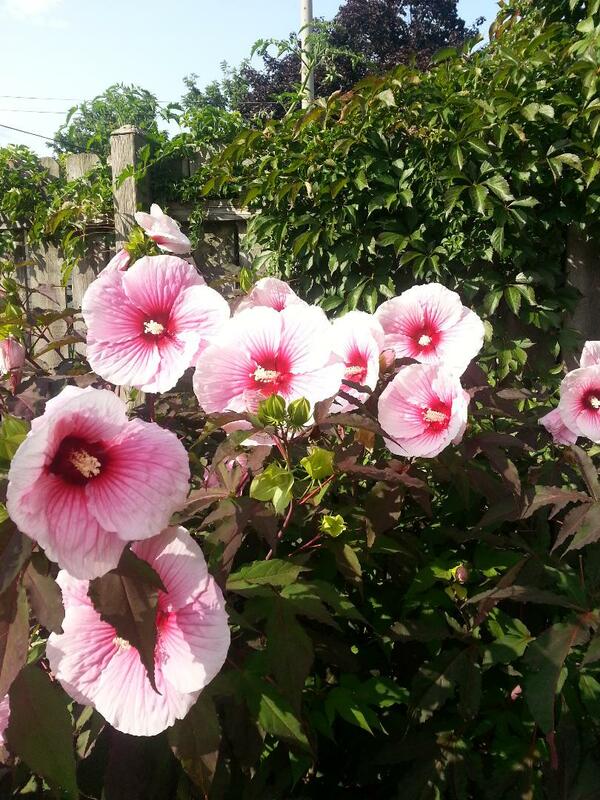 First off, we can enlarge the garden area in the back corner of the house and add in more color with perennials—like pink coneflowers and other small flowering plants. Removing some of the red rose bushes and replacing them with more varied plantings will create more of the mix I am after—even though I haven’t quite figured out exactly what those plants are! 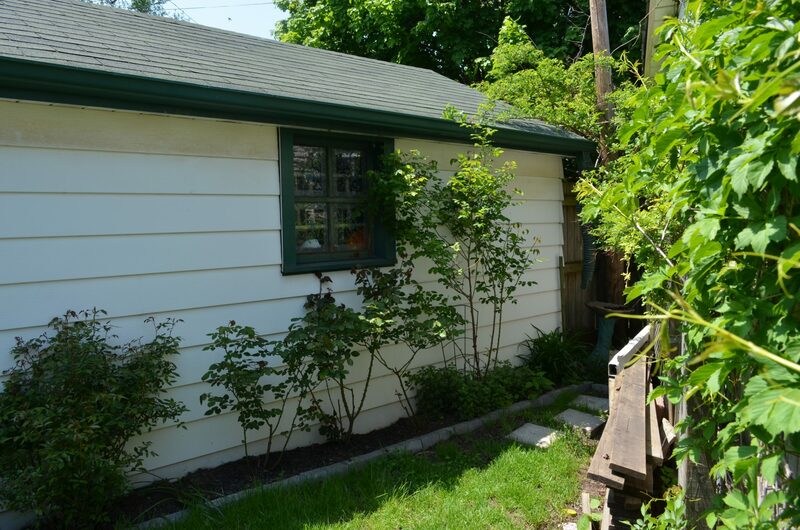 We can add climbing roses and some trellises to hide the peeling paint on our neighbor’s garage. Perhaps doing a raised vegetable garden with tomatoes and zucchini. I’d LOVE to remove the patio stones, also take out the patch of grass on the right, and lay a random pattern flag stone to increase the hard surfaces and give us space to put a small table and a couple of chairs so we have a place to sit—right near the new garden. 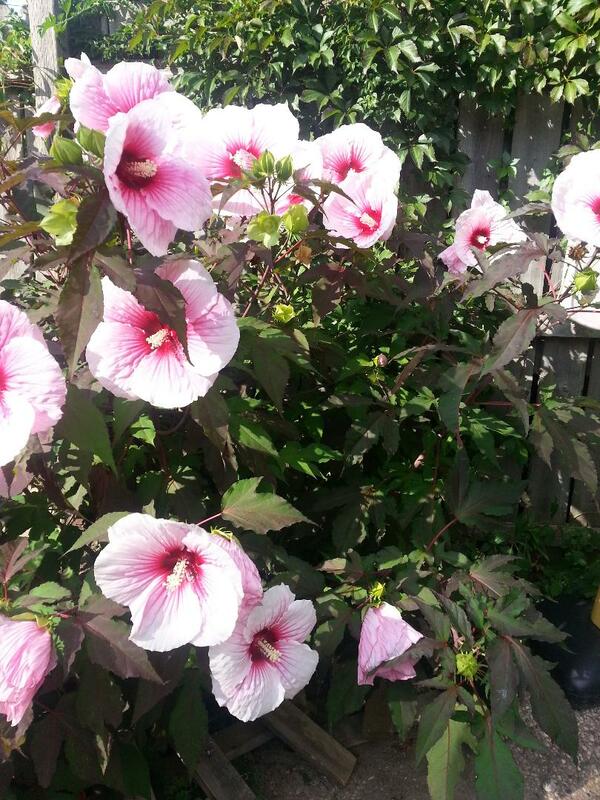 These are a few of my ideas for the backyard and even though I am not really a gardener, I have figured out a few things over the years! This year’s plan will be to work on the gardens and the plants. Next year we can hopefully work on the flagstone patio (or maybe the year after that) as we would most likely have to hire someone for a project that big! And for the secret garden? We have thought of a fire pit, or a water play area for the kids, or some chairs for quiet afternoon reading…not really sure yet so we are open to ideas! Most of all, when all is said and done, I’d love for our backyard to be a place that we actually enjoy spending time in. A place where the kids can play but also where we can admire the beauty of creation and enjoy a little sunshine over the few months we call summer. 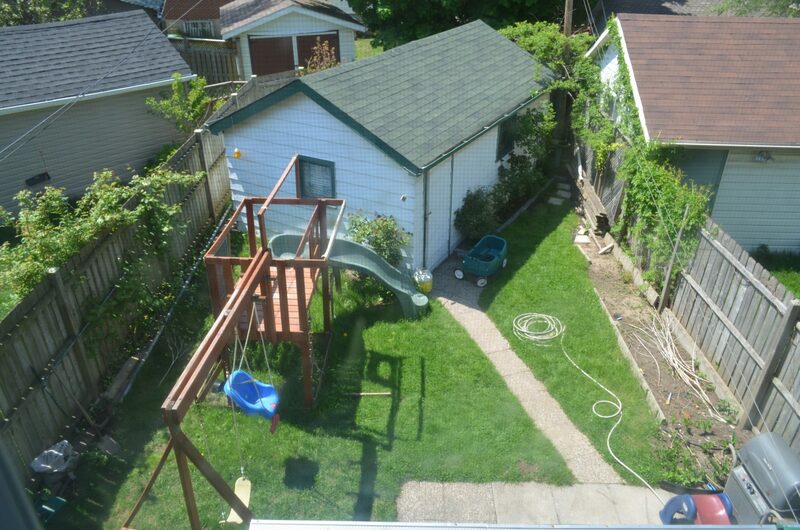 Our backyard may not be magazine worthy, but as long as it makes my heart smile…it will be well worth the effort.